One of the items Mendelssohn took on his walking tour of Scotland with his friend Karl Klingemann in the summer of 1829 was this sketchbook. A proficient draftsman in the tradition of German Nazarene artists such as Friedrich Olivier, the composer recorded picturesque scenery in clear, confident outline. He used graphite first, later firming up the composition in pen and ink. 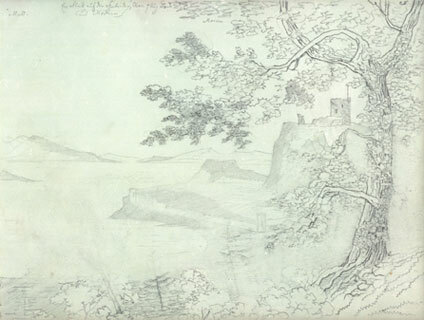 On 7 August the two young Germans arrived at Oban on the west coast of Scotland, and Mendelssohn made this sketch from the mainland, showing Dunollie Castle at Oban, with the village of Morven on a promontory beyond, and the island of Mull, one of the Hebrides, to the left. Mendelssohn composed the view with the assurance of an experienced picturesque traveler, framing the vista with a windblown tree.